(Michael Barnes, Liberty Headlines) Massachusetts Sen. Elizabeth Warren has a “likeability” problem — but acknowledging it means you’re sexist, according to a budding news media narrative. Washington Post reporters Annie Linskey and David Weigel set the table last week about the media’s new rules heading into the 2020 election cycle. The reporters made their case on the heels of Warren’s announcement that the staunch progressive Democrat is forming a presidential exploratory committee, a first step in an official White House bid. “Before you run against Trump, you have to run against Hillary (if you’re a woman),” the reporters wrote, with the premise being that likability standards are rarely, if ever, applied to men. “It was the question often asked of female candidates and rarely of men: Is she ‘likable’ enough to be president? Others put it another, potentially more devastating, way: Is she too much like Hillary Clinton to be the nominee?” said Linskey and Weigel. The article was published in the paper’s “Politics” section, as opposed to “Opinion” section. Lesser news outlets ran with the agenda setting narrative, as is often the case. The website Axios published friendly bullet-point quotes tying Warren to Clinton, and managed to slip in a scapegoating quip about Russia. “I won’t comment on private discussions she’s had except to say that she’s more than happy to talk to anyone considering a run about the challenges (as well as the great things) that go with it, and lessons learned on what to watch for in this next cycle (aside from Vladimir),” Clinton spokesman Nick Merrill said. But the obvious problem with the media’s likability-sexism narrative is that Linskey and Weigel’s own newspaper provides many examples debunking the entire point — leaving reasonable minds to wonder why journalists would pretend otherwise. In 2016, the Post’s own Chris Cillizza, a politics writer who now works for CNN, wrote that Hillary Clinton had a likability problem, although it was in service to bashing then candidate Trump. “Hillary Clinton has a likability problem. Donald Trump has a likability epidemic,” he wrote. A simple site-specific Google search shows the Post has published numerous such articles on male presidential candidates, almost all of whom happened to be Republicans. “Is Mitt Romney likable enough to win?” a 2012 article was titled. “Can Mitt Romney become more likable,” reads another. “Can Mitt Romney be likable? Does he need to be?” reads yet another. One Post article dating back to 2004, flipped the script on disgraced Democratic presidential hopeful John Edwards, and said that “being likable wasn’t enough” for the former North Carolina senator to win the ’04 Democratic primary. All of this takes place within the context of Warren’s extremely rocky start. In Oct., Warren willingly released the results of a genetic test showing she is 1/1024th Native American — less than the average North American white person. The results permanently undermine her bogus Native American ancestry claims that were the basis for her Harvard law school teaching career, her lucrative career in private practice and her political ascent to the U.S. Senate. More recently, Warren embarrassed herself on Instagram Live on New Year’s Eve. 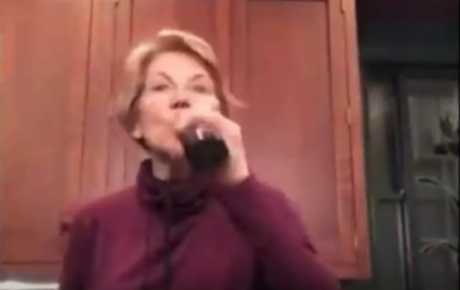 Democratic consultants and social media progressives ripped the 69-year-old for chugging a beer in a “desperate” and “inauthentic” attempt to connect with millennial voters. “Elizabeth Warren seems more like a chardonnay senator than a beer senator,” said Tobe Berkovitz, a longtime Democratic communications specialist. Unmentioned was the fact that Warren’s political career, replete with anti-capitalist rhetoric, has been bankrolled by none other than George Soros, a billionaire activist and ruthless hedge fund manager.